Easy PC? I Don't Think So! Today Will Be A Good Day! Do you see the ring on the photo? Of course you do. You can hardly miss it, can you? Well let me tell you a story. Today I had to go see my accountant. Not the most exciting way to spend an afternoon but these things have to be done. Because my daughter wanted a lift to college at 2pm, we decided to kill two birds by dropping her off first and then going into Nantwich early so that we could go to the market. That didn't happen, though. Instead we ended up at the Civic Hall because, unbeknown to me beforehand, they were hosting an antiques fair. As luck would have it (or not?) I only had £20 on me so there was no chance I'd spend money I couldn't afford. I was happy enough with that; it would still be enough to allow me some little extravagance. As Richard had to go elsewhere for a few minutes, I mooched around alone, looking at all the beautiful bits and pieces on display. So many things - so little money! When I finally bumped into Richard again I felt obliged to hint about the beautiful ring I'd seen on "that stall over there" (picture woman pointing widly so as gentleman by her side can't possibly mistake where the ring can be found). Obviously, I was hoping he'd buy it for me but really didn't think it would happen. What I wasn't expecting was for him to slide it on the third finger of my left hand and ask me to marry him! Weyhey! I'm engaged! And it happened in the middle of an antiques fair in Nantwich Civic Hall. We're going away to celebrate on Sunday. Just two nights at a B&B in Llangollen but hopefully it’ll be nice and romantic being as it's just the two of us. Should I pack some frilly knickers? Today's word count isn't worth mentioning - I've been too busy with other things. I have to re-arrange the way I've been doing my accounts and download tons of online invoices and bank statements so that nice mister accountant man can sort out my proof of income for 2005/2006, and going out today left me exhausted so I slept for about 4 hours afterwards. Let's just say the total increased by point four percent. The Nantwich Civic Hall is a better place than the slipper section of the Hudson's Bay department store, which is where my husband proposed (also minutes after buying the ring)! I can't believe you're blogging about word counts and accountants when you just got engaged!!! Sharon! That is such a lovely story. What a lovely romantic man. 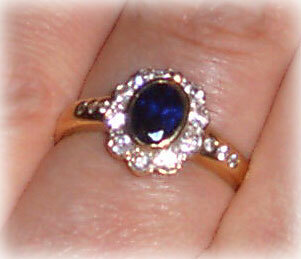 And a very beautiful ring. I hope you'll both be happy ever after. Celebrate your socks off (and your frilly knickers too, you brazen hussy!) in Langollen-- hope you have a fab time. Excellent! The first NWG wedding. It's got to be worth a mention in the Chronicle, surely! Aha! Have sorted out my identity crisis. Speaking as Iona instead of Imogen, I'd like to say congratulations too!! We haven't set a date because I really want my mum to be at the wedding and as my dad's very ill, he can't travel and she won't/can't leave him. I don't really want to think about what's going to have to happen before mum will be able to leave London but in the meantime we'll be laying plans. So far, all we know is that we'd like to hold it in a hotel that arranges civil weddings as that would be easiest for friends and family who'll need to travel a considerable distance to get here. What a wonderful thing to happen. At least you'll have lovely memories of the proposal. And that ring...it's gorgeous. Have a great few days alone. I'm so glad I visited your blog today. Many Congratulations - what a lovely story, lovely ring, lovely man. All a romantic novelist's hear desires. Congratulations - and how ROMANTIC. That's lovely. Have a fabulous weekend away. So pleased for you - but pack the works darling and make it a day and night and day to remember!!! Congratulations to you both. What a lovely story. Have a lovely time and forget about word counts. That is sooo romantic! Many, many congratulations. The ring is beautiful. Do you know whose ring it reminded me of when I first looked at it - you remember Princess Diana's engagement ring?? I'm completely bowled over! So many people wishing us luck, love, happiness and the rest. Richard's pretty surprised by it all too, and has asked me to thank you all for the lovely wishes you've sent. Karen. Nantwich Civic Hall will never be the same again. I never used to like the place but I do now :) Hey! Maybe we could have our reception in there! It's a thought. Kate W. I'm glad you popped in, too. It's like our very own romantic novel, isn't it? And nice of Sid to congratulate in his own purry way. Kate H. Thanks. I'm sure we'll enjoy it. Minx. The frillies will definitely be coming with me! Congratulations, Sharon! What a great story! And I hope you have a great time in lovely Llangollen. Add me to the list of people wishing you luck and joy! It's like you're living your own romantic novel. As an author of rather nasty crime thrillers I'd be crazy to try the same thing ... but am delighted for you both. Advice re the wedding - try not to have too fixed an idea of how it should go - just be determined to enjoy whatever it is! Hope this doesn't spook you out too much coming from you-still-don't-know-who! Thanks Julie, Debi and Annie (??). Coming in late for the congratulations! Sharon and Richard. I am sooooo late with this but many many congrats, to you both. You are a terrific couple and the happiness you share shines out of you both.